The warm summer weather has many people spending time out in the yard and opening windows. While everyone should keep enjoying the weather, the Minneapolis Police Department wants all residents to take some simple steps to avoid becoming victims of crimes of opportunity that happen during the warmer months. Thefts and burglaries increase in the spring and summer months because of open doors and windows. More belongings in garages and yards also get stolen at this time. Pin windows so that they open only far enough to allow air in but not far enough to allow a burglar to use them to gain entry to your home. Six inches is recommended. Secure your front door when working in the backyard. Some burglars are brave and fast enough to enter your home and make off with valuables before you know they have even been there. Don’t leave garage doors open even for a few minutes. The visible items stored there make a tempting target to someone passing by. Don’t leave valuable items such as bicycles and lawn equipment in your yard, especially overnight. Beware of the influx of door-to-door salespeople and home repair contractors. Do your homework before hiring anyone to do work on your home and get a written estimate before work begins. And remember that all door-to-door salespeople must be licensed by the City, so ask to see a license. Report suspicious activity in your neighborhood to 911 immediately. Waiting to call will most likely take away the opportunity for officers to reach the people behind the suspicious activity. A number of home burglars have been caught as a result of neighbors calling 911 right away. Never allow someone you don’t know into your home. Common ruses used to gain entry are requests to use a phone or to get a drink of water. For more information on burglary prevention, go to:www.minneapolismn.gov/police/crimeprevention. Have an old fridge or freezer? Call Xcel Energy – they will pick it up, haul it away and recycle it—for FREE and earn a $50 rebate thru August 31. After August 31, you will receive a $35 rebate. Visitwww.xcelenergy.com/Fridge or call 1-800-599-5795 for more information and to schedule your free, in-home pickup. The fridge or stand-alone freezer must be in working order and 10 – 30 cubic feet. This is part of the Clean Energy Partnership between Xcel Energy and the City of Minneapolis. Hennepin County Library is hiring Public Service Assistants (PSA). Starting salary is $12.85/hour and both full and part time opportunities are available at a variety of city and suburban libraries in Hennepin County. PSAs assist patrons with library cards, account information, and paying fines. They provide direct customer service, including answering account questions, responding to complaints, and assisting patrons with library equipment and computers. They also sort and shelve library materials and use computers to find account information and create reports. Interested candidates should visit www.hclib.org/about/jobs for more information or to apply. Applications will be accepted thru August 17. 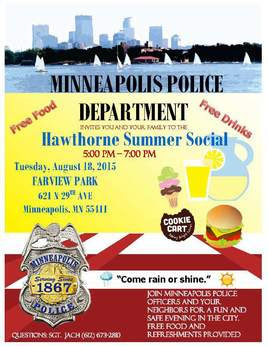 Join the Minneapolis Police Department, Council Members Blong Yang and Barbara Johnson, and neighbors for a fun and safe evening in the city onTuesday, August 18from 5 – 7pm at Farview Park (621 29th Ave N). The Minneapolis Police Mounted Patrol, K9 and SWAT will be in attendance. 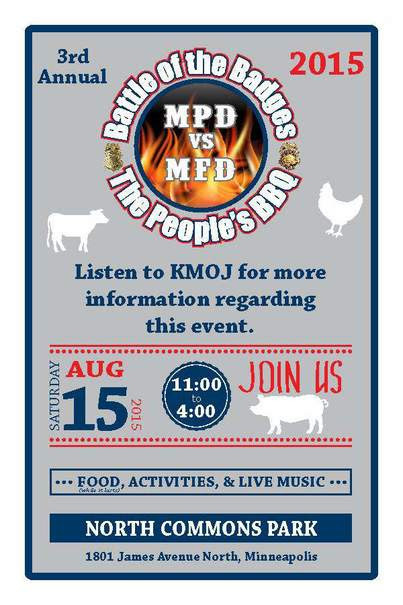 Minneapolis Fire Department and the North Paramedics will have a rig there as well.The City of Minneapolis’ Youth Violence Prevention will also be there hosting a Pop-Up-Park with fun activities for kids. Free food and drinks will be provided, courtesy of Richard and Tommy Cohen. Come rain or shine! The Folwell Neighborhood in partnership with the Minneapolis Park and Recreation Board and Minneapolis Solid Waste & Recycling, are proud to announce the opening of a residential organics drop-off at Folwell Park on August 19, 2015. Residents interested in participating are encouraged to stop by the park anytime between 6 -8pm on August 19 to learn about organics recycling and get their questions answered by the City’s Recycling Coordinator. Bring your organics as the drop-off carts will be on site for the meeting! Residential organics include all food waste (including food you shouldn’t compost in a backyard bin such as meat, bones, and dairy products), food-soiled and non-recyclable paper (egg cartons, paper plates), and other compostable materials such as coffee grounds, filters, cotton swabs, dryer lint, and popsicle sticks. Yard waste and pet waste are not accepted. Residents must drop-off their organic materials in a compostable bag (either a paper grocery bag or a certified compostable plastic bag). Larger items such as pizza boxes and egg cartons do not need to be bagged. The drop-off will be open to all Minneapolis residents at no cost. For the first several weeks, the drop-off will be open Tuesdays evenings (4 – 7pm) and Saturday mornings (9am – 12pm). Volunteers will be on site to answer questions, train new participants, and gather some information from residents using the drop off. After volunteers are no longer needed, those who sign up to participate for the drop-off will be given the code to the locks. For more information on the Folwell Park residential organics drop-off and the citywide organics recycling program roll-out, visit minneapolismn.gov/organics. Save the date! The McKinley Community Rummage & Bake Sale will be onSaturday, August 22 from 9am – 2pm, so stop on by and check out what is for sale and grab a treat while you’re here. We are collecting gently-used, clean items (clothing, small electronics, etc.) to sell during our Community Rummage Sale at our community offices, with all the money going to help fund community events, e.g. National Night Out, Movie Nights, Community Meetings, etc. Just drop off any gently used item at 3300 Lyndale Ave N, either in the office, or if we are closed, you can drop items off in the back of the building. If you want to drop items off for the Bake Sale, please drop them off the morning of the event and wrap items individually for single sales. Have you ever wondered how emergency calls in Minneapolis are dispatched? How streets get plowed? How the water gets to your faucet? Or, how property gets developed? The answers to these questions and more will be discussed at the Minneapolis City Academy program beginningSeptember 17th. The City Academy will be held weekly on Wednesdays from September 23rd through October 21st at locations throughout Minneapolis. Each session will focus on one aspect of City government such as public safety, public works, planning and development and fire services. Sessions will run from 6:30 to 9:00 PM. The program is open to all Minneapolis residents who are 18 years or older. The academy is filled on a first-come, first-served basis. Please complete the application form that can be found online: www.minneapolismn.gov/ncr/MinneapolisCityAcademy. Do you want to save money on your utility bills and conserve energy without sacrificing comfort? Get some free low-flow showerheads and faucet aerators made available through a partnership with the City and CenterPoint Energy. These devices are designed to use less hot water while also providing good water flow. Putting just one showerhead and one faucet aerator in a family home can reduce hot water use by more than 4,200 gallons in a year, and residents can get up to three of each for free. Showerheads are available in a chrome or ivory finish. Faucet aerators are available in kitchen or bathroom models. To order and for more information on this program, go to www.centerpointenergy.com/lowflow or call 1-866-425-1748. We’re looking for one high quality candidate to work with us in a one-year AmeriCorps position through Public Allies from September through June 2016. Please send a resume to hiring@clevelandneighborhood.org if you are interested in applying. A position description is listed below and an FAQ regarding the Public Allies program is located here. We are seeking an energetic and qualified member to work with us this year to build on our organizations ability to help neighbors move from being simply a resident of their neighborhood into an active community leader. You should be able to work flexible hours, including some Saturdays and evenings. Proficiency in Microsoft Word and Excel required. Ability to stand on your feet for more than 1 hour is necessary for doorknocking and outreach activities. Ability to work with and engage a diverse population is essential as well as a willingness to knock on doors and interact with strangers. Strong communication skills are desired. Position will pay $1500/month stipend and an education reward at the end of the year.